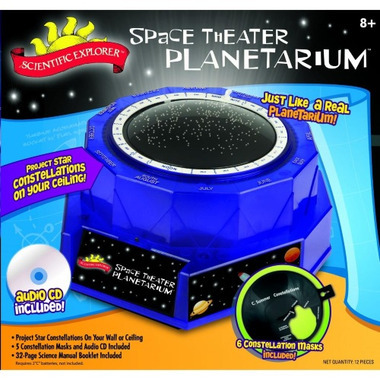 Transform your child’s room into an amazing planetarium with this Space Theater Planetarium kit from Scientific Explorer®! This is a great way to introduce kids to astronomy. Turn off lights and play the audio CD for kids to learn about amazing science facts and ancient stories about the stars. 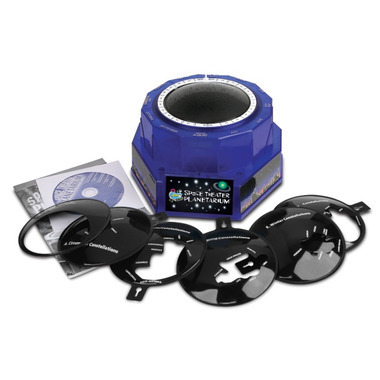 6 different masks for the projector are included, the Sky Mask and 5 Constellation Masks. The Sky Mask displays stars that are only visible in the sky on a particular date and time. The Constellation Masks fits over the other masks to isolate 5-7 different star groups – one mask for each season and one for the stars of the northern sky. All masks can be adjusted to the different location of stars at different dates and times. This is a perfect educational gift for kids ages 8 and up!